Second attempt at quiche! Broccoli and Cheese! Instead of using half-n-half in the egg mixture as I did with my first ever quiche , I used whole milk and sour cream. I also toned down the nutmeg, dashing a bit of paprika, chilli powder, and more salt this time around. 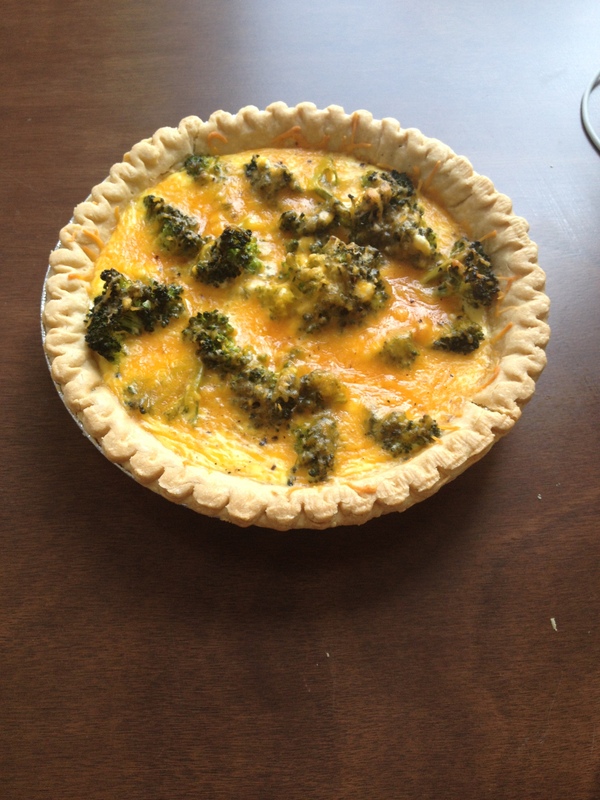 I like my own version with sour cream more – the Broccoli and Cheddar Cheese Quiche tasted less eggy and creamier than the last one. Hope you enjoy! 0. Preheat oven to 400 degrees Fahrenheit. 1. Saute onion and broccoli in olive oil in frying pan over low-medium heat. I like sauteeing the onions separately for a couple of minutes before adding the broccoli. Keep an eye on these vegetables as you do steps 2 and 3, making sure that they soften but don’t brown. Add a dash of salt. Take off heat when cooked. 2. Prick the base and sides of thawed pie crust with fork. Bake thawed pie crust in oven, 10 minutes or until it turns golden. 3. Beat eggs lightly until mixed, add milk and sour cream, beat lightly. Add nutmeg, paprika, chilli powder, black pepper and salt to mixture, mix. 4. Check pie crust, when done; let cool. Push down any bits that might have risen in the baking process. Turn oven temperature down to 325 degrees Fahrenheit. 5. When pie crust is cool, sprinkle a thin layer of cheddar cheese on bottom. Next, tip in broccoli and onion, arrange in pie so that vegetables are spread out. Pour in egg mixture, and then sprinkle top with cheddar cheese. 6. Bake in oven for 35–50 minutes until no longer wobbly or runny. This quiche took me 40 minutes to bake in a conventional oven. Yum! I love your recipes – they look so wholesome and healthy! Wow thank you – you have such an amazing blog, so I’m flattered! (I used to live in Singapore, so I really enjoy reading through your reviews and recipes :)). What’s there not to love about a quiche, I say. Hey Sheila, was going through your blog and juz loved ur “Eastern” and “Western Recipes”. 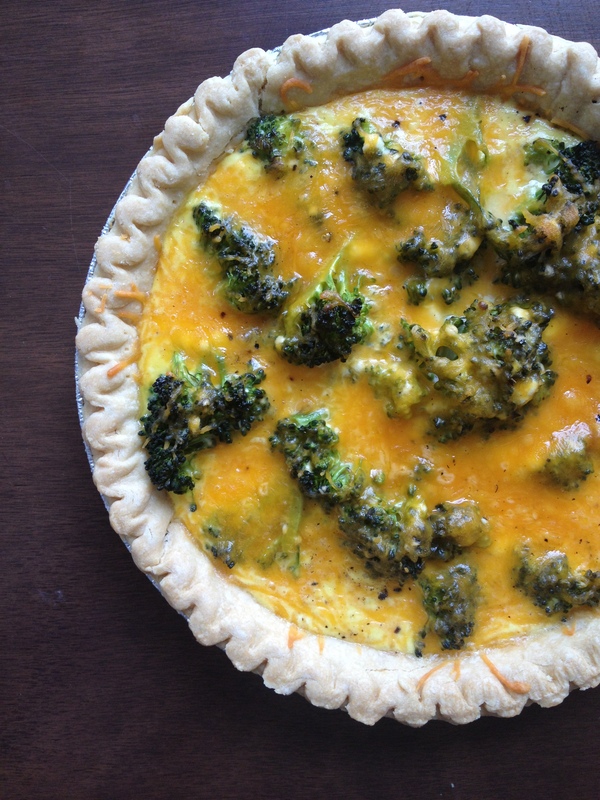 Now thats a broccoli quiche done right, count me in!